In 1887 Paris, Nathalie dreams of being a reporter and gets a break during the summer between school years. She's hired by her father's friend to do the daily morgue report, writing about the unidentified bodies that are displayed part to seek identification and part as a sideshow attraction. But when a murdered girl turns up in the morgue, Nathalie gets a strange vision of the last moments before her death. As the death toll climbs, Nathalie must grapple with her strange visions and determine what they mean, not just for the investigation into the serial killer but also for her own sense of self. Nathalie herself was a fun character, someone who was fascinated with death and morbid subjects without necessarily being maudlin herself. I enjoyed her outlook, not just on her job but on the world in general. She seemed very grounded, with a strong sense of her goals and skills. There were a variety of different relationships within the story, including two close female friendships that alter radically during the story's timeline. Nathalie's relationship with her mother is also explored, as her mother is both overprotective but hampered by a recent injury. There's a continuous push and pull between them as Nathalie tries to hold down her new job and find out about her past, while her mother tries to keep her in the dark for her own safety. There's also a very slight romance that I really enjoyed, although romance is a bit of a strong word. More of a crush. I love crushes, I think that stage of things is underutilized in fiction in general. Nathalie's crush and the way she way she acts around the young man is sweet and very realistic, but it doesn't progress to anything else because complications, and I really liked that. 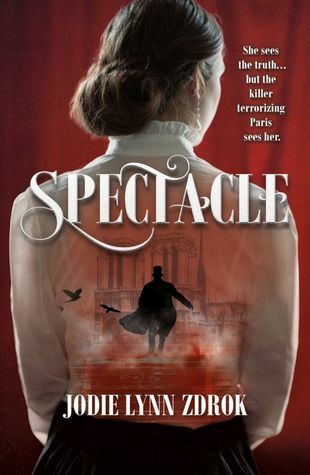 While Spectacle is mostly rooted in the 'real world,' there is (obviously) an element of the paranormal with Nathalie's visions. Although, in fact, there's a whole group of people who have magical abilities. Seems about 20 years prior there was a man who figured out how to give magic to people through one of his experiments and he did the procedure on as many people as wanted it. There's just...scads of people out in the world, able to do superhuman feats. Yeah, no one cares. The scientist was disgraced because of some very severe negative side effects that popped up and...that's it. The magic people just quietly dropped out of the public consciousness, and apparently NO OTHER SCIENTIST AFTER THAT wanted to figure out how he did it? Wanted to study the people? Maybe expand on it? Just...nope, go on your way magic people, no one's even going to keep track of you and your literal superhuman abilities that could lead to, like, murder maybe. It just struck me as really weird and I had a problem with it. The pacing of the book was generally repetitive, with Nathalie having a huge problem coming to grips with her vision ability. Which is fine if there's something still pushing her into the plot, but there's really not. She hates it, she waffles about hating it, that goes on for a few hundred pages before we get going again. There were points where it was a real stretch to keep her involved in or even aware of the plot because 'coincidence' seemed to be the only outside force acting on her. And then at the end, there were so many false climaxes that it was honestly kind of a let down. The main bad guy we'd been following for the majority of the book had an underwhelming conclusion, then we had a couple of false starts for a new bad guy, and then the final-final bad guy was introduced out of the blue, barely 50 pages before also being taken out. The stop and start nature of the final act made what should have been a catharsis into more of a confusing muddle. Will I continue this series? Probably not, but you can add the next book, Exposition, on Goodreads.